Before Master Yee left Hong Kong, he found the time to learn from His Brother, Yee Sihk Tim, a practitioner of the Bak Hsing Choy Lee Fut system, the “Lin Wan Chop Choy”, a technique that he feels is a great attacking method as well as the Mouse stepping patterns. This style was created by the Grandmaster, Tam Sam. He also found time to learn some Northern Shaolin from his other brother Albert Yee. In 1968, Master Yee emigrated from Hong Kong to Montreal, Canada. Soon after, he went to Toronto where he earned a Mechanical Engineering degree from George Brown College. During this period in Canada, in addition to working and going to school, he taught Hung Ga Kung Fu at George Brown College, the Jong Ting Association, and the Hung Moon Association (also known worldwide as the Free Masons). There he met and became close friends with Master Lore (Loh) King Hung (James Lore) of the Village Hung style. Master Lore shared and taught him his methods of stance shifting, a specialty of Master Lore’s. He also learned the Elbow Cover Blade method of the Butterfly Knife which master Yee felt was useful and added it into his Mother /Son Double Knives form (Ji Mo Seurng Dao). During those early years in Canada, many stories of the exploits of Master Yee and his students are still talked about today. These moments in history where Master Yee and his students helped to bring the community into a state of peace, while bringing justice, are talked about like legends of the past. In 1973, Master Yee arrived in New York City’s Chinatown to be reunited with his aging medicine teacher Doctor Sit Chuek Sing, who was famous for his healing skills and whose family was renowned for having been the personal physicians to the Imperial Ching Emperors of China for four generations. Doctor Sit was also known as one of the four famous four doctors of Hong Kong. Master Yee continued his studies of Dit Da and herbal medicine during this time, assisting and running his Chinatown Clinic. Master Frank Yee also learned internal medicine from his teacher’s son, Dr. Sit Chiu Wai. It was during this time that Master Yee decided to stay and teach in NYC establishing Yee’s Hung Ga Kung Fu Academy. His teachings became a sort after commodity. While his students demoed as well as competed, winning in numerous championships, soon he became a familiar name amongst the NYC Chinatown greats. His Lion dance skills were also in high demand, which led to him sharing his Lion Dance skills with many noted kung fu associations. In addition to teaching at his kung fu school, Master Yee found the time to teach at Long Island and Columbia Universities as well as Hunter College. During the early New York City years, Master Yee was one of the founding fathers of the Eastern United States Kung Fu Federation and had served as its President, Vice-President and Secretary. He became an avid supporter and protector of the Chinese Staff and Workers Union in NYC Chinatown as well as its Vice President, attending many of their rallies with students and providing security and protection for the workers when situations arose. On one such occasion he and his students were asked to attend the Union rallies for the fair treatment of restaurant employees. They were expecting trouble, and when the trouble appeared Master Yee dispatched his students to end the threat. These occasions were the norm during the turbulent Chinatown years as he was called upon to help different organizations in times of need. 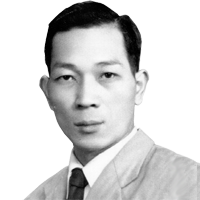 During the early eighties he would have a chance meeting and introduction to Master Kwan Tak Hing, renowned movie star and humanitarian. It was from Master Kwan that Frank Yee would learn Crane Qigong as well as his specialty, the six and one-half point Long Pole techniques, which Master Kwan Tak Hing was famous for. He also studied Buddhist meditation with Master Kwan. Their relationship was such that Master Kwan often treated Master Yee as a close friend, but he had too much respect for him, and considered him like a teacher. Master Kwan Tak Hing bestowed upon Master Yee, two couplets of personally done calligraphy, One referencing “To clean the name of the Sick Men of Asia”, and the other stating that “his skills are number one”. Master Yee later donated the first couplet to the Huang Fei Hong Museum in Foshan, Peoples Republic of China, where it proudly hangs today. Moving forward, Master Frank Yee met his Sisuk Jyu Yuen Ming, who had recently moved to NYC Chinatown. He was a student of Grandmaster Tang Fong as well as the famous Tai Chi grandmaster Cheng Ting Hung, whose fighters were renowned for winning numerous Lei Tei (Platform) matches in Hong Kong and Taiwan. Master Cheng was also famous for a set called the “Yin and Yang Method of Tai Chi Gong” which was a set Qigong exercise, which developed incredible ging and amazing ability to take blows. It is from his Sisuk Jyu Yuen Ming, that he later learned these exercises and then traveled with his Sisuk to visit and do some additional training with Master Chen Ting Hung. Master Yee later taught only the Yin portion of the exercises to his students as he felt this portion was a good benefit and better fit for the them. In 1984 Master Yee was invited to be a part of a special Kung Fu delegation invited by the Chinese government for an exchange of knowledge. This trip took him across China, to the Shaolin temple and to Taishan the birthplace of his father. When he saw the poor conditions that existed there, he felt saddened. This planted a seed that would grow exactly one decade later. After the passing of his father, Master Yee often wondered what he could do in memory of his father and family name. Thoughts of building a park for children to play in their family name, or building a monument, the decision was slow coming. In 1994, after a series of life changing events Master Yee had the opportunity to spend 9 months in Taishan, China. 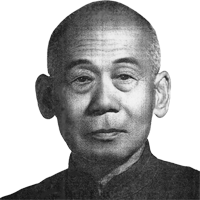 During this time he immersed himself in his Hung Ga training and began teaching the elderly, Wong Fei Hung’s Traditional Hung Ga Kung fu. Even though the students were of advanced age, they still worked hard and always longed for the traditional teachings. This sparked the idea that he would move to Taishan and establish a lineage. In addition he would teach for free to give back to his father’s city. It was also during this time that he established new personal goals; and created the Taishan City Toi Sing Kung Fu Association where he still teaches traditional Hung Ga Kung Fu and lion dance. Master Yee accepted only those students who showed a commitment to learning and who were of high moral character. He provided living quarters, equipment and training to his students free of charge. Through his school, he worked to revive traditional Southern kung fu in China in the face of the onslaught of wushu. It is due to his dedication that the people of Southern China are being reintroduced to and are embracing traditional kung fu once again. At the request of the Taishan City government in China, he is currently the President of the Taishan Kung Fu Association, overseeing martial arts activities for the city of Taishan. He also serves as an advisor to the Wong Fei Hung Museum in Foshan, China as well as the coach of the museum’s Traditional Kung Fu Division. During his interactions in China he helped to promote the first traditional kung fu championships in Guangdong, in which practitioners paid an entrance fee, an unheard of and unknown idea in China. The consensus was that people would never be interested in that. But Guangdong province tried the idea and soon found themselves overwhelmed as they had more than five thousand competitors wishing to compete. They had to arrange regional championships in different parts of the province to handle the mass turnout, culminating in a final determining event for the winners. Master Yee’s Students placed first in many events as well as became the Lion Dance champions of Guangdong Province. The Name of Yee’s Hung Ga International Kung Fu Association and the Taishan City Martial Arts Association was now firmly established in Southern China. Master Yee, while in Hong Kong on one of his many visits, was introduced to Shaolin Monk So Jan, a 103 year old, 38th Generation successor of the Shaolin Temple. He had graduated and left the Northern Shaolin Temple to travel south in 1922. He is believed to be the last living fully graduated Monk that exists from the time before they burned the Northern temple in 1929. Sifu began spending some time and established a friendship. This monk would later ask Master Yee to help him in his pursuit of rebuilding the original Fukien Po Tin Southern Shaolin temple on the true grounds where it stood. After Monk So Jan went south, he met up with and had trained on the grounds with the successors of the Southern temple after it was grazed. It seems that the original surviving monks continued to practice at the ruins, which is where Monk So Jan headed to after visiting his family and continued training there. He was considered successor to both the North and South Shaolin temples as proved by being in possession of the Green and White Jade Seals (Chops), which was gifted by the Tang Dynasty’s Emperor, one to the North Temple and One to the South. Monk So Jan, along with Master Yee, also supported by members of the present day Northern Shaolin Temple, after meeting with the government officials and pleading his case, was given a parcel of land near, but not on the grounds. As a gift of appreciation, Monk So Jan gave one of the seals to be placed in a museum. He bestowed upon Master Yee the title of 2nd advisor to the new Southern Shaolin temple, which was to be built. Upon returning to the States Master Frank Yee wanted to promote and reignite the flames of traditional kung fu here as well as to honor the name of Great Grandmaster Wong Fei Hung by inaugurating the Wong Fei Hung Northeastern All Kung Fu Championship tournament in 1996. This annual tournament grew each year, attracting over 500 competitors from all over the United States, Canada, Europe, South America and Asia, with over 136 divisions including Traditional Kung Fu, Modern Wushu, Shuai Jiao, Internal Styles, Fighting, Chi Sau and Push Hands events. This Championship ran for 13 consecutive years. In 2001, Master Yee wished to introduce his USA disciples to Taishan and bring the whole family together. When word spread of the possible visit, he was asked to have a friendly meeting and exchange of skills in a no holds barred method with the Foshan Ching Woo Association. It was requested that some of their fighters meet some of his. Master Yee immediately agreed and called upon his senior disciple and adopted son Pedro Cepero Yee to prepare fighters for the event. When the USA Family arrived they performed across Hong Kong for their Uncles and Si Tai Pau and then in Foshan at the Wong Fei Hung museum as well as the Taishan Sports Arena. This arena has 3,500 seats. The show was filled to capacity as well as 6-8,000 people trying to break down the doors to the stadium to see the Americans perform/ even the government officials could not get through. The military was called in to clear a path, as the event could not start without them. Taishan city is one of the oldest martial arts towns in China and to hold an audiences attention there, needs a high level demonstration of skills. Master Yee’s show held the audience captivated and to standing applause for nearly 3 and ½ hours. It was an astounding effect. The skill level was now demonstrated and Yee’s Hung Ga across the world had gained newfound respect in the international martial arts community and its birthplace. The final stop would be the exchange at the Ching Woo Association. Up to this point, all the demos were aired on national television. When the USA team arrived it was asked that we exchange as friends, with no need to have physical confrontation, but to show unity to the world and demo, as friends would have a greater effect on the Martial Arts Community. And so it was, establishing greater ties with the Ching Woo Association, and future joint workings to promote our traditional values and systems. 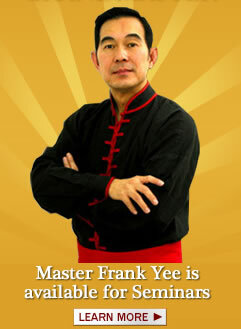 During the years in China Master Frank Yee made many friends in the Martial Forest who contributed to the growth of Master Yee. One such friend, was Mr. Gong Wuen who would give Master Yee access for 8 hours a day, to many rare and ancient martial and military arts manuals in the Government Libraries. This allowed Master Yee to gain insight into the beginnings of many weapons and fighting arts and actual battlefield records, military and martial strategies that were used in wars past. This helped improve Master Yee’s views on many things. Another such friend of over twenty years today is 94 year old Grandmaster Chan Wing Yan (Chen Rong En) of the Fut Ga Style. He was a disciple of the Great Grandmaster Leung Ting Chiu, the creator of the Flying Dragon Pole System and the Fut Ga System. Their friendship had grown so close that Grandmaster Chan Wing Yan stated that they should become blood brothers, but Master Yee had so much respect for Grandmaster Chan, and looked at him as more of a teacher. Grandmaster Chan Wing Yan shared with Master Yee his Pole and empty hand techniques. Grandmaster Chan also put on DVD for Master Yee the pole and hand methods of the system for a historical record. This has allowed Master Yee’s Pole techniques to blend the teachings of three teachers. Master Yuen Ling, Master Kwan Tak Hing and Master Chan Wing Yan. Over the last decade Master Frank Yee has appeared in numerous documentaries and many national and international magazines and covers. He is well known in China for his 2 episodes of “GDTV’s Search for the Twenty Heroes of China” and “Exercises of the Martial Field”. Both of these have been airing for more than ten years almost weekly. 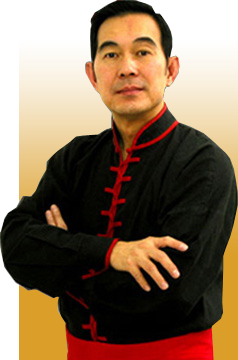 He has been asked to represent Wong Fei Hung’s Traditional medicine on numerous talk shows in China as well as numerous medical forums, and many other television shows which air across the country. He established a ranking system in 1974 to better gage the development of students, while setting strict criteria into levels. As branches grew, and instructors reached a certain level he established a Dan (Duen) system to maintain the standards of the art. This system added levels of testing for instructors 1-10. Level 10 could only be obtained after you at least reach the age of 60 years, and have been a full instructor for at least 40 years. Master Yee himself conducts these tests, with instructors above the level being tested for.